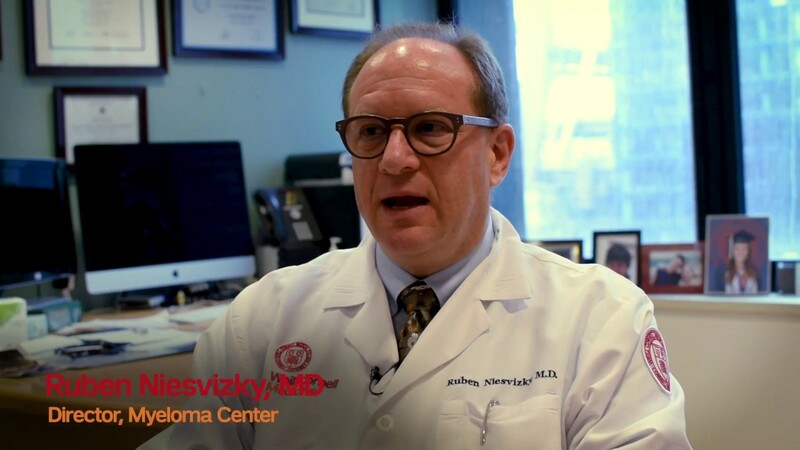 Weill Cornell Medicine’s world-renowned Multiple Myeloma Center is dedicated to delivering the most advanced treatment and comprehensive care for patients with all stages of multiple myeloma and related plasma cell disorders. We also treat rare plasma disorders such as amyloidosis, POEMS, light or heavy chain deposition disease and cryoglobulinemia. We are an integrated center and have developed an outstanding multidisciplinary team that includes medical oncologists, hematologists, radiation oncologists, surgeons, radiologists, pathologists, transplant physicians, nurses and other healthcare professionals. 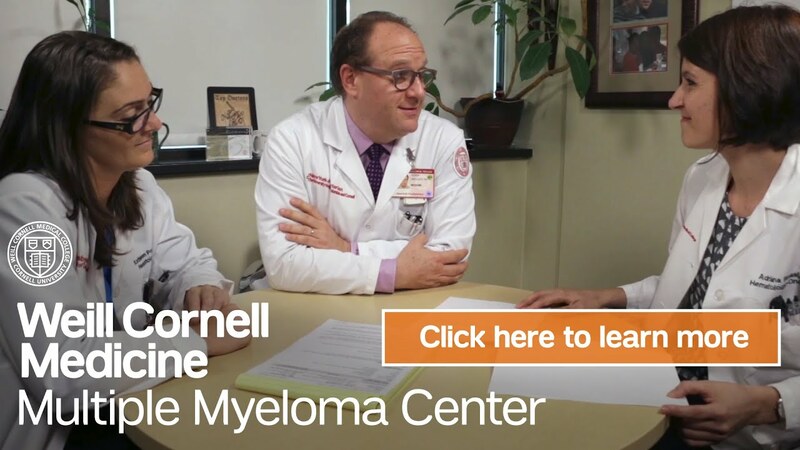 At the Weill Cornell Multiple Myeloma Center, we view each person as an individual, and our approach ensures that each treatment regimen is narrowly tailored to meet the unique needs of each of our patients and their families. We pride ourselves on the one-on-one relationships we develop with our patients and their loved ones, and we collaborate with referring providers to ensure that everyone is on the same page with regards to the course of treatment. Additionally, we realize that a cancer diagnosis can affect your whole life, so we provide support beyond just delivering the best medical treatment. We offer educational sessions, support groups, nutritional guidance, and more. Our team is comprised of physicians, physician assistants, nurse practitioners, research and therapy nurses and medical assistants, all devoted solely to the care of patients with plasma cell disorders. Our focus is on compassionate care and internationally recognized research, developing novel therapies for patients at all levels of their disease while working towards a cure. Treatment options for multiple myeloma have expanded greatly in recent years. We provide a personalized treatment plan for each patient, taking into account characteristics of the myeloma, side effects and dosing of medications, the individual's experience with prior therapies, as well as any other medical conditions. Whether newly diagnosed or in a relapsed setting, we offer standard therapies such as stem cell transplantation and immunotherapies, as well as a number of clinical trials evaluating new therapies or treatment combinations. In addition to offering standard treatment therapies for multiple myeloma and other plasma cell disorders, we offer access to the most promising new drugs and medical procedures through clinical trials. These trials allow us to bring new therapeutic options to our patients, often years before they become widely available. We are committed to moving the field forward through medical advances with the potential to alleviate the suffering from myeloma in the future. Our ultimate goal is to find a cure for multiple myeloma. As New York’s premier healthcare network, Weill Cornell Medicine is at the forefront of scientific research and clinical trials, enabling us to provide a full range of diagnostic and treatment protocols, including the latest breakthroughs in medicine. We have the latest knowledge, expertise and experience, and we put our patients at the center of everything that we do. We provide outstanding clinical care in the context of a world-class clinical research program. The team at the Multiple Myeloma Center is dedicated to delivering the most promising diagnostic testing and treatments in a supportive and collaborative environment so that our patients and their families receive the best possible outcomes and quality of life. 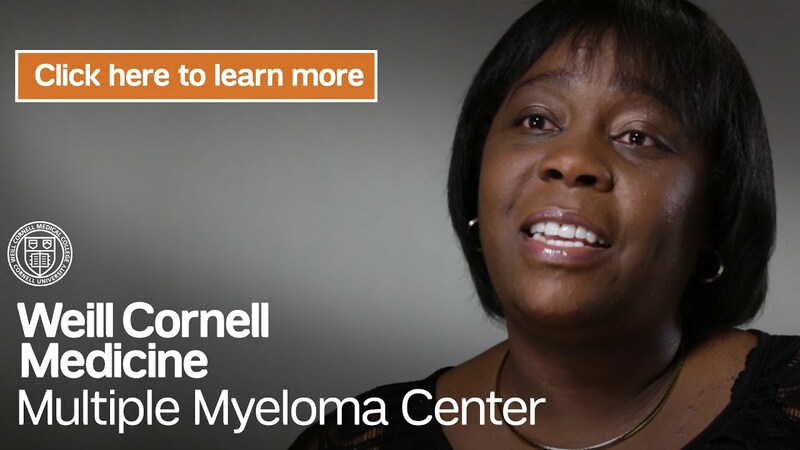 People living with myeloma in New York City, throughout the United States, and around the world come to the Multiple Myeloma Center at Weill Cornell Medicine. We also conduct more studies in blood cancers than any of our regional peers, allowing us to provide our patients with access to many multi-phase clinical trials. Weill Cornell Medical College is ranked among the nation’s best by U.S. News & World Report year after year. Roger N. Pearse, M.D., Ph.D.
Karen A. Pekle, M.S., A.N.P.